Fresh from a national sold-out tour, the hilarious hit comedy show Mamba Republic will have two performances at the Hexagon Theatre on November 10 and 11. Mamba Republic is a rapid-paced satirical sketch-comedy. Reuniting the talents of Ben Voss (Beauty Ramapelepele) and John van de Ruit (Spud), Mamba Republic takes a savagely funny look at all that is wrong and very wrong in the Rainbow Nation. 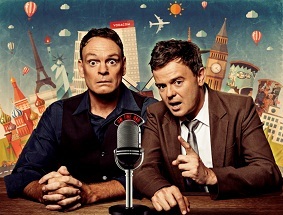 With their unique blend of sharp wit, hopeless optimism and clever characterisation, the duo sink their fangs into the fiascos, farces and foibles of South African life. Adding to the duo on stage, the team is spear-headed by Durban theatre leader and visionary, Mervyn McMurtry as director and designer. Mamba Republic follows in the footsteps of Green Mamba (2002) and Black Mamba (2005) which together racked up over 800 performances in five years, winning numerous awards and developing a cult following all over Southern Africa.